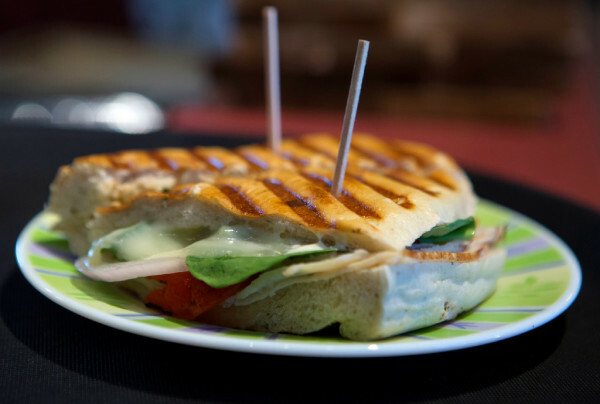 A fresh panini is seen at Verona Wine and Design in Bucksport on Wednesday. Mike and Colleen Gross opened the store and tapas restaurant in June. Mike Gross makes a sandwich for a customer at Verona Wine and Design in Bucksport on Wednesday. Mike and his wife, Colleen Gross, opened the store and tapas restaurant in June. 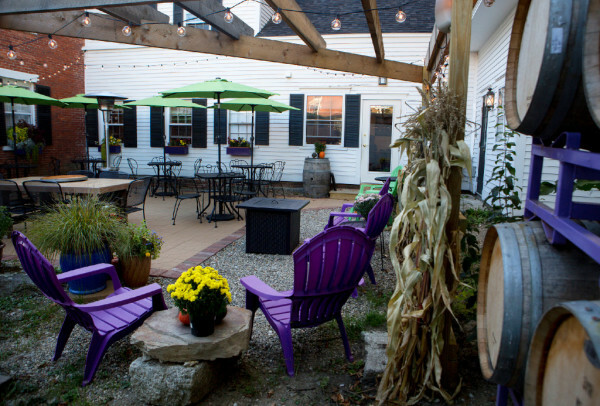 The outdoor patio is seen at Verona Wine and Design in Bucksport on Wednesday. Mike and Colleen Gross opened the store and tapas restaurant in June. Kathy Denis (left) and Kathy Andrews look over the menu at Verona Wine and Design in Bucksport on Wednesday. Mike and Colleen Gross opened the store and tapas restaurant in June. Colleen (left) and Mike Gross opened Verona Wine and Design in Bucksport this June. The store offers a retail side, where they sell various wines, and their tapas restaurant. 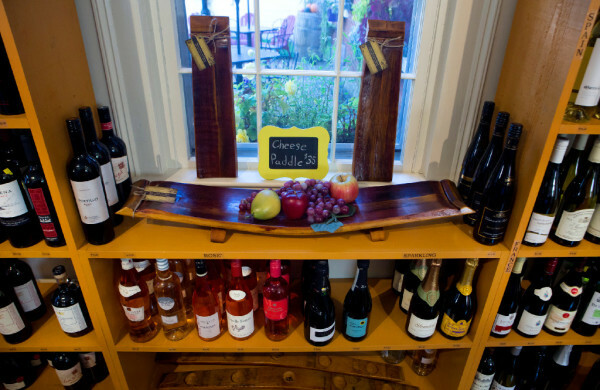 Wine and wine barrel art sit for sale at Verona Wine and Design in Bucksport on Wednesday. Mike and Colleen Gross opened the store and tapas restaurant in June. Various types of wine sit in the retail side of Verona Wine and Design in Bucksport on Wednesday. Mike and Colleen Gross opened the store and tapas restaurant in June. About eight years ago, when Colleen Gross moved into a house in Orrington after her divorce, she bought a painting at TJ Maxx to hang above her new dining room table. She didn’t realize until she put it on the wall that the painting of an idyllic cafe in a leafy, pastoral small town with a little outside patio had a sign on the bistro depicted in the image. The scene in the painting has become a reality, as she and now-husband Mike Gross in June opened Verona Wine & Design, a little cafe and shop, at 77 Main St. in downtown Bucksport. The painting hangs in the indoor dining area as a reminder of the unique path the pair took to get where they are. 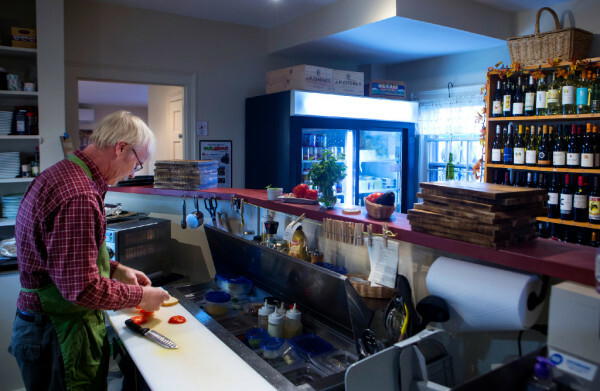 Offering tapas-style small plates, desserts and a carefully selected wine and beer menu, as well as wine and gifts for purchase, Verona Wine & Design is an intimate, laid-back eatery that’s a welcome addition to the growing, diversifying Bucksport downtown. Before the cafe, however, Colleen and Mike Gross were just a newly married couple, enjoying food, wine and their new life together. The couple met when Mike, then also recently divorced, was doing some construction work on Colleen’s sister’s house. They clicked, and five years ago were married, moving to Verona Island. Mike Gross, an accomplished carpenter who also teaches technology and industrial arts in the Bucksport school system, built pergolas — wooden archways — in the backyard of their new home. He wanted to find a plant that would grow on them quickly and provide shade. Grape vines fit that bill. Three years later, the couple harvested 11 pounds of Concord and Niagara grapes off two vines, and Mike was inspired to try his hand at making wine. He now makes multiple varieties of wine for their own consumption, though they someday would like to open a small farm winery on their Verona Island property. Through their at-home wine-making and their own research, the couple have together discovered a shared passion for wine. “We love wine. We’ve both learned so much over the past few years and have really grown to love and appreciate the culture behind it so much,” Mike Gross said. Mike Gross also got interested in the properties of wine barrel wood, after seeing an Adirondack chair built from barrels. He ordered some oak wine barrels online and built a bench from it, showcasing the wood’s unique coloring because of the red wine aging within and the coopering marks from barrel rings. Soon enough, the Grosses were making candle holders, napkin rings, serving boards, wall hangings and, of course, wine racks, and selling their wares at area shops and festivals and online in their Etsy shop, dubbed Verona Wine & Design. After getting involved with Bucksport Heart and Soul, a community building organization in town, the pair knew that starting some sort of business downtown where they could sell their wares and serve wine was the right direction to go in. 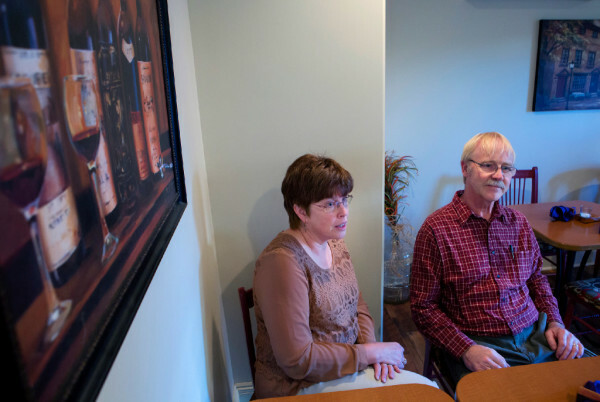 Neither Colleen Gross nor Mike Gross had any experience in the restaurant industry, but the pair decided that a shop selling wine and their wooden wares, with a small tapas bar attached, was something they wanted to do — after they finished their days at their full-time jobs working in Bucksport schools, that is. The space at 77 Main St., tucked in the back of the large brick building, used to be an apartment. When the couple toured the space over the winter, there was still carpeting on the floors. There was also an overgrown, unkept courtyard accessible by a side door. Where previous tenants might have seen a nondescript outside area, the Grosses saw a private, romantic patio, lit with twinkling lights and a firepit, surrounded by greenery and with a jazz trio set up in the corner. After a few months of renovations, Verona Wine & Design opened in June. 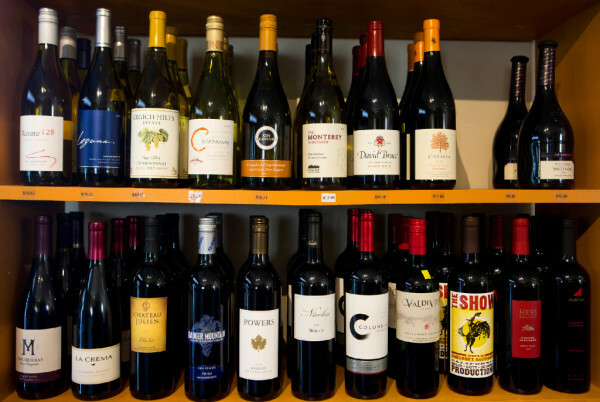 The wine list is very reasonably priced — between $16 and $28 for full bottles — and wine is also available to purchase in the front of the space, along with their wooden wares and other goodies. The bar, built by Mike Gross, is constructed from wine barrels, as are all the cheese boards and a number of decorative items hanging on walls and sitting on tables. The menu is small and was devised entirely by Mike and Colleen Gross, who also cook. Neither has commercial kitchen experience, but what’s offered is very simple. There’s a charcuterie board, a smoked seafood board, a cheese board and a hot bacon and swiss dip with crostini. A few sandwiches, a hummus plate and bruschetta plate, and a soup round out the rest of the menu — though the most popular menu items remain their house-made Chocolate Lava Cake and Mixed Berry and Apple Blossom mini-pie. Though the couple plans to keep the restaurant open year-round, they likely will end weekday lunch service for the winter, instead offering dinner only, Wednesday through Sunday, and lunch on Saturdays and Sundays only. The Grosses said their first summer of business was a success, buoyed by traffic from Bucksport’s Wednesdays on Main events and movies at the nearby Alamo Theatre, and a general feeling in town that things are finally on the upswing, after several difficult years before and after the closure of the Verso Paper Mill. Verona Wine & Design is located at 77 Main St. in Bucksport, suite 1A. Fall hours are 11 a.m. to 9 p.m., Wednesdays-Sundays. For more information, like Verona Wine & Design on Facebook.